For 2018 we plan a collaboration with Maurin Donneaud to figure out a toolset and workflow that brings together the worlds of electronic textiles and fiber optic illumination. 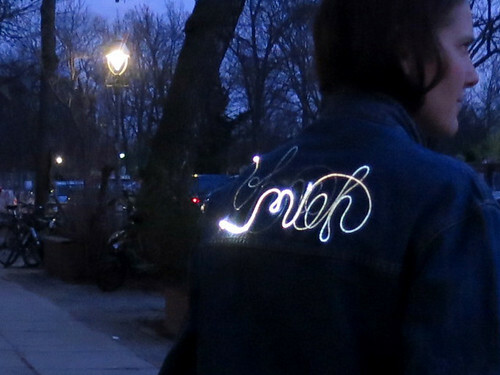 In the field of E-Textiles and wearable technology, many designers use light illumination as a dynamic design element. 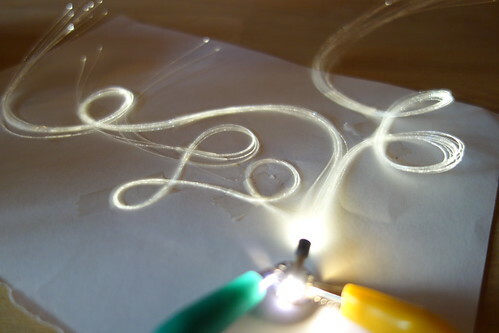 Use of fiber optics with LEDs is one of the most common methods for embedding light into textile designs. Despite this demand for fiber optic textile integration, there are no ready-to-use toolsets for making the connection between the textile electronic circuitry and the light source for illuminating the fiber optics that are robust and suitable for the use with textiles in a wearable technology context. We propose to design, test and produce a manufacturable PCB and connector design for connecting optic fibers with LED light sources. This design needs to be robust, durable, washable, comfortable. The design must withstand the requirements of being embedded into textiles, with sewable electrical connections that suit e-textile soft circuitry practices (conductive threads, fabrics, fibers) and resilient against the wear that comes from being worn on the body in daily life. 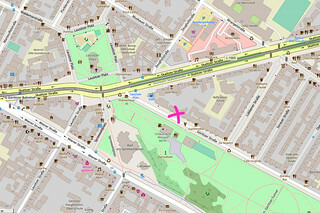 Lulu_Pitch from Donneaud Maurin on Vimeo. Use of light in textile and fashion design is becoming more and more common and many schools (i.e. Weissensee Art Academy, Swedish school of Textiles) started to teach this subject as a part of their textile design curriculum. Optic fibers could be embedded in textiles as embroidery, in weaving, knitting and knotting process and many innovative textile designs have been realized in recent years. 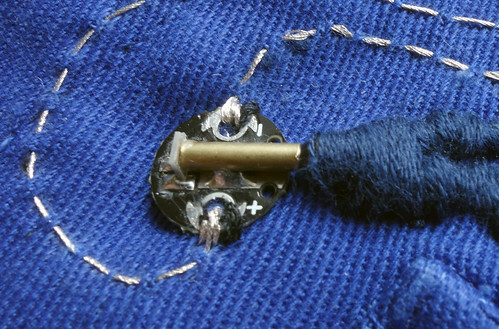 But often the designers lack the toolset for connecting the light sources with the embedded optic fibers, resulting in re-purposing bulky connectors and technology and hiding them behind the textiles. Currently there are no such toolsets and instead each designer has to come up with their own re-purposed or DIY solution. Unreliable connections between fiber optics and light source result in poor illumination of the fiber. What Lulu provides is a simple, reliable toolset for E-Textile designers to work with fiber optics design. Instead of struggling to solve the light source and connection problem, the designer can concentrate in the aesthetic issues in the design process. The communication bus system will make it easy to use multiple light sources and program their behavior. As Lulu is small, light and sewable PCB that is suitable for soft circuitry, the entire electronics can be embedded in textile, making it flexible and wearable. The outcome of the Lulu project will benefit current E-Textile and wearable technology designers who work with fiber optics embedded designs, as well as educational field of these designers (i.e. smart textile course at universities) as it will make it much easier to teach the use of fiber optics. For distributing the finished Lulu product, we want to collaborate with online distributors and local retailers so that the outcome is purchasable by anybody looking for this kind of solution. In the field of Electronic Textiles (E-Textiles) and Wearable Technology (Wearables), being able to sense and actuate materials, as well as transmit data through materials, are some of the main fields of research. Optic fibers are extruded nylon filaments that are efficient at transporting light within their core. 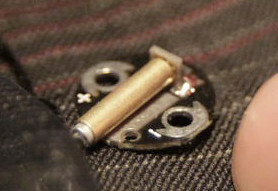 They are interesting for use in E-Textiles because they are long, thin, flexible and relatively robust, meaning it is possible to integrate them with many existing textile techniques. “Lulu is a connection solution that brings together the worlds of electronic textiles and fiber optics. Electronic textiles is a field of research and production that looks at embedding electronic functionality directly into textile materials. Fiber optics are extruded nylon strands that are very efficient at conducting light from one end to the other and are mostly used in high-speed data communication where data is transmitted using light as the medium. Our objective is to collaborate to produce a manufacturable design for LED lighting connection between soft circuitry and optic fibers. To demonstrate this design in practice by producing a series of examples and tutorials. To collaborate with manufacturers and distributors to make this design available to makers, designers, engineers. 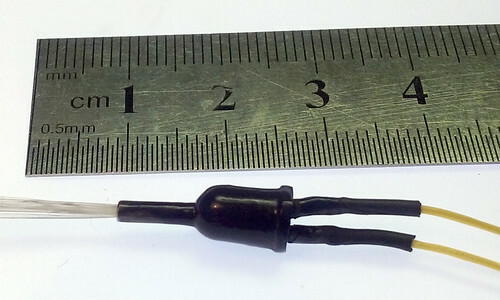 The Lulu is a hardware design solution that connects the end of an optic fiber with an LED light source and breaks out the electrical connections of this LED for connecting with soft circuitry (conductive fibers, fabrics, threads…). While with this Lulu proposal we are focussing primarily on the use of optic fibers for optical actuation (emitting light for visual purposes), this same solution could also be used for data communication over light (LEDs can also be used as Light Dependant Resistors LDRs), as well as bend sensing, since light is lost when then optic fiber is bent. Mounting a light sensor (or using the LED as a light sensor) at the opposite end of the optic fiber and measuring how much light comes back it is possible to use the fiber as a bend sensor. Light Emitter: illuminating optic fibers (sideglow) for visual effect by treating the optic fibers such that light emits from their sides. Data Transmitter: data communication between the ends of the fiber, and along the length of the fiber. Bend Sensor: sensing bend of optical fibers by mounting a light source on one end of the fiber and a light sensor on the other and measuring how much light reaches the sensor. This works because light is lost when the fiber is bent. Many designers use light/illumination as a part of their dynamic design element. 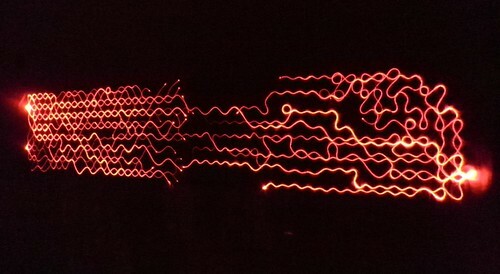 Use of fiber optics with LEDs is one of the most common methods for embedding light in E-Textile designs. People who will benefit from this work include: artists, designers, engineers, educators, students, makers… working in the fields of E-Textiles and Wearable Technology. This design will provide a robust, durable, washable, comfortable solution for working with light and optic fibers in E-Textiles and Wearables. 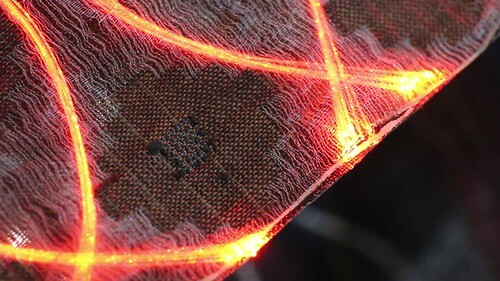 The design will withstand the requirements of being embedded into textiles, with sewable electrical connections to suit E-Textile soft circuitry practices (conductive threads, fabrics, fibers) and resilient against the wear that comes from being worn on the body in daily life. There are currently no off-the-shelf solutions for making the connection between the end of the optic fiber and the LED light source that are suitable for use within E-Textiles or Wearables. The Lulu will provide this solution to anybody needing it. The idea for this project came from Maurin Donneaud in 2016, and was first realized as a swatch for the 2016 eTextile Summer Camp Swatch Exchange (http://etextile-summercamp.org/swatch-exchange/lulu/). KOBAKANT first used this first version Lulu for their KOBA opening collection items “Poetry in Motion” (http://www.kobakant.at/KOBA/ohne-mich/). Using the Lulu v1 allowed us as designers to quickly test, prototype and produce the final pieces, concentrating on the esthetic layout of the fiber and the design of the light behavior. The v1 prototype illustrates the potential of it becoming a fiber optic toolset for E-Textile projects. 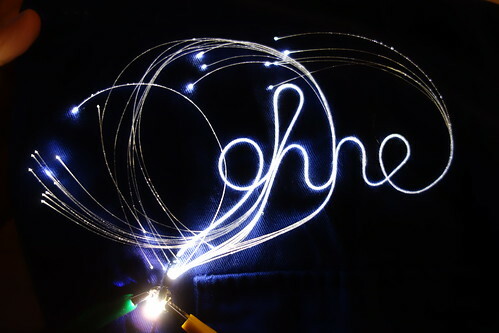 Bellow you can see the Lulu in the final “ohne mich” design with a single strand of 1.5mm diameter sideglow optic fiber embroidered into the overlaid words “ohne” and “mich”. Only when the words illuminate (one after the other) is the viewer able to identify the individual words. The current v1 prototype needs to be assembled by hand in a labor-intensive process due to the non-industry standard placement of the LED. Therefor it is not possible to pick-and-place assemble and affordable distribute the current design to a larger audience. The WORTH funding will help us improve many such aspects of this design, bringing it to a manufacturable state with new PCB design, LED solution and the connector design to suit the industrialization process. 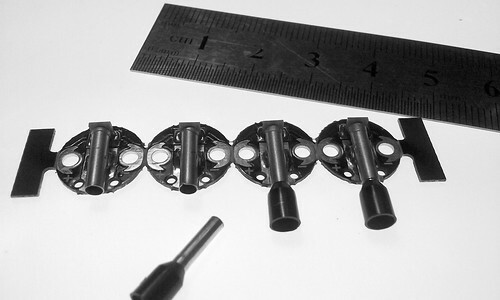 We will be publishing all of our work as Open Source Hardware (OSH). OSH technologies ( https://www.oshwa.org/ ) promote an ethical practice which results in the development of technologies that are more relevant to local ecosystems, and local facilities. We want to collaborate with a PCB manufacturer producing using environmentally conscious methods. As part of this project we want to inform ourselves of the options. Push the project towards commercialisation by contacting distributors to produce and retail the Lulu solution. Specialized in interaction design and physical computing, I develop projects between crafts and technology. One of my researches consists in rehabilitating gesture into digital media handling, to enrich Human Computer Interaction and enhance crafts through the use of smart technology. Therefore I collaborate with technicians, artists, researchers, fashion designer and textile companies. Involved in textile design schools such as ENSCI (Paris – France), ENSAD (Paris- France), ENSAAMA (Paris – France), ESBA (Le Mans – France), I share my knowledge to contribute into eTextile development projects and highlight the richness and creative potential of this practice. Background: Graduate in industrial design, ENSCI-Les Ateliers (Paris – France), specialized in eTextiles, Maurin is working as freelance designer since 2005. Maurin is the co-fonder of Datapaulette eTextile Paris hackerspace. – PSA Peugeot Citroën, luminous textiles and textile sensors for automotive market. (2016-2017). – Doublet, connected floor slabs for events and scenography (2015). – Nestlé, connected T-shirt for an advertising campaign (2015). – General Electric-Healthcare, eTextile Giant Keyboard for persons with disabilities (Boston, 2011). Mika Satomi and Hannah Perner-Wilson have been collaborating since 2006, and in 2008 formed the collective KOBAKANT. Together, through their work, they explore the use of textile crafts and electronics as a medium for commenting on technological aspects of today’s “high-tech” society. KOBAKANT believes in the spirit of humoring technology, often presenting their work as a twisted criticism of the stereotypes surrounding textile craftsmanship and electrical engineering. KOBAKANT believes that technology exists to be hacked, handmade and modified by everyone to better fit our personal needs and desires. 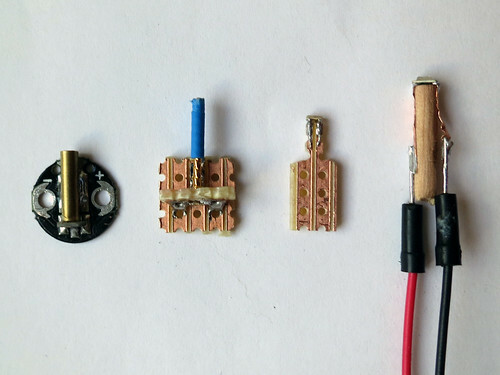 In 2009, as research fellows at the Distance Lab in Scotland, KOBAKANT published an online database for sharing their DIY wearable technology approach titled HOW TO GET WHAT YOU WANT. 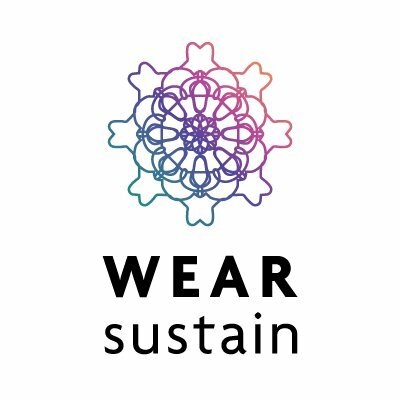 In 2017, KOBAKANT has received WEAR sustain funding to realize an eTextile tailor shop. The project is currently running in Kreuzburg Berlin. We have been working in the field of E-Textiles since 2006, starting with our first collaborative project “Massage Me” (http://massage-me.at/), an E-Textile game controller vest with embedded textile buttons. Ever since then we have been researching, experimenting and publishing our E-Textile and Wearable Technology documentation online at HOW TO GET WHAT YOU WANT (http://howtogetwhatyouwant.at). 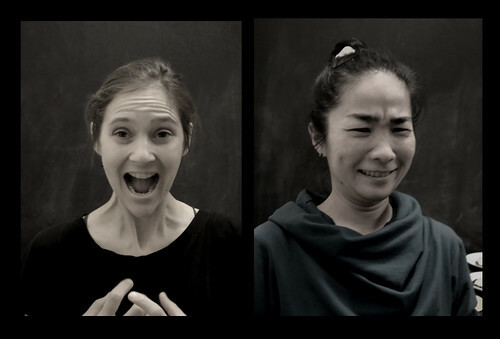 On the KOBAKANT website we publish our artistic and design work (http://kobakant.at) which includes works like “The Crying Dress”, “Involving The Machines” and “WishLab”. We both have experimental approaches to developing new technology and applying it for personal, expressive, performative applications. Although we work well together, we have not had the chance to work together in this capacity with the goal to develop and release a product like this. 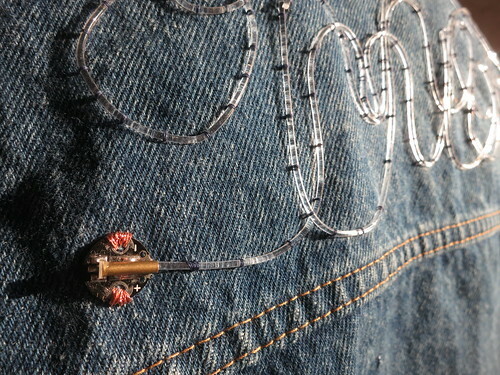 Both partners work in the field of E-Textiles for over 10 years as designers, engineers and also as educators. They have often published their work in the scheme of Open Source / Open Hardware and contributed in the knowledge building of the field. The previous collaboration of the partners not only benefited themselves as project production, but also have also contributed to the field in the form of open source designs, educational materials and online tutorials/documentation.